A sinus lift or sinus enhancement treatment is a common type of oral surgery that is used to enhance the height of your maxillary bone to allow the patient to have other treatments such as dental implants. Your maxillary sinuses are found behind the cheekbone area and run from under your eyes to just above the upper portion of the back teeth. It is extremely common for the roots of your back teeth to extend into these sinus areas. If those teeth need to be removed due to decay or damage, very little supporting bone structure is left in between the mouth and maxillary sinus. This lack of supporting structure is what necessitates the need for a sinus lifting procedure. Dental implants and gum grafting surgery are the most common reason of needing a higher volume of bone in the posterior maxilla. 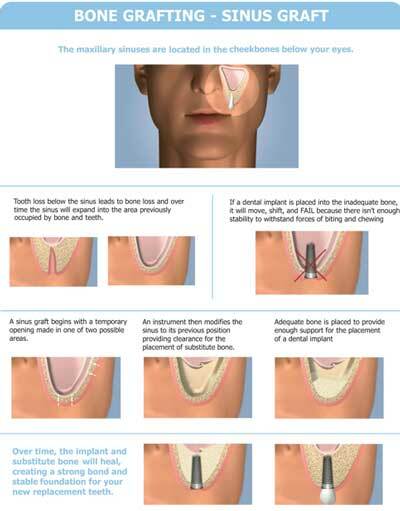 Historically,Sinus Lift complications due to bone grafting has led companies create new minimal-surgery techniques to drastically reduce additional risks. One of our internationally accredited and licensed periodontists in Bangkok or our Dentists in Phuket will first need to properly assesses your current health and dental history along with the current condition of your sinuses. Our easy online virtual consultation can give you a proper assessment or second opinion of your need for Inlays and Onlays, or upper jaw and sinus areas with X-rays or the more accurate dental CT Scans. 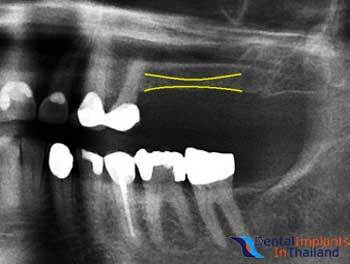 If sending us your X-rays or computed tomography “Dental 3D or CT scans” is not possible until you arrive, then we can still have the doctor provide some estimations, however please note no guarantees will be in place until the doctors are able to accurately determine the height and width of your existing bone structure. Sinus lifting is considered an autogenous bone surgery usually performed under twilight anesthesia and on an outpatient basis (no hospital overnight). The treatment starts by exposing the sinus bone. The oral surgeons then begin the bone grafting to enhance and strengthen the sinus flooring by helping to promote natural bone development. When the sinus flooring structure becomes sturdy the next stage of the dental restoration continues usually with the addition of new oral implants. A sinus lift is an older technology to surgically manipulate the maxillary sinuses to allow for implant positioning. Today, there are many other highly effective alternatives to sinus lift surgery such as the new zygomatic implants,basal implants and tuberopterygoid implants that allow our dentists to easily restore the upper jaw with a permanent dental bridge and implants in just a few day dental vacation. Sinus lift surgery recovery will require about 4-7 nights in Bangkok. 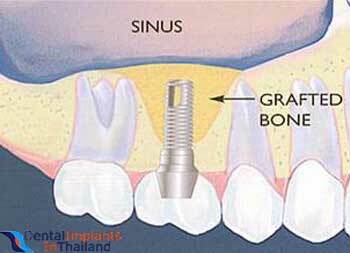 The cost for having sinus lift at the Dental Center of Thailand will depend on the type of grafting needed needed along the conditions of your bone structure. To get actual prices and qualify for multiple-area discounts our dentists will need to understand your exact needs via a dental questionnaire and pictures/x-rays or CT scans. To give you some estimates, please see below. Please note the prices for Sinus Lifts in Phuket are generally priced about 25%-30% higher than Bangkok. For those looking for a no-hassle dental vacation package, We also provide complete dental holidays to Thailand that include your dental treatments,boutique recovery hotel and round-trip transportation for you + 1 guest. To learn more sinus graft treatment or to learn more about our high-quality and affordable dental holidays to Thailand please contact us today.